ItemI-52629 - "Clearing land on area no. 5 by the windrow method of piling slashings, southeast of Prince George"
ItemI-52618 - "Progress chart of developed horse-power in BC." ItemI-52653 - "Moose on the ground-hog range - Cassiar District. They decide to leave the Survey party but leisurely in single file". ItemI-52654 - "Moose on the ground-hog range - Cassiar district, a last look back before disappearing in the tall timber". ItemI-52655 - "Lakelse Lake and hot-springs, pleasure resort near Terrace - central interior of British Columbia". ItemI-52630 - "Ferry on Francois Lake, central interior of British Columbia". ItemI-52402 - "View of apple orchard". ItemI-52403 - Aerial view of town. ItemI-52404 - Bouquet of flowers. 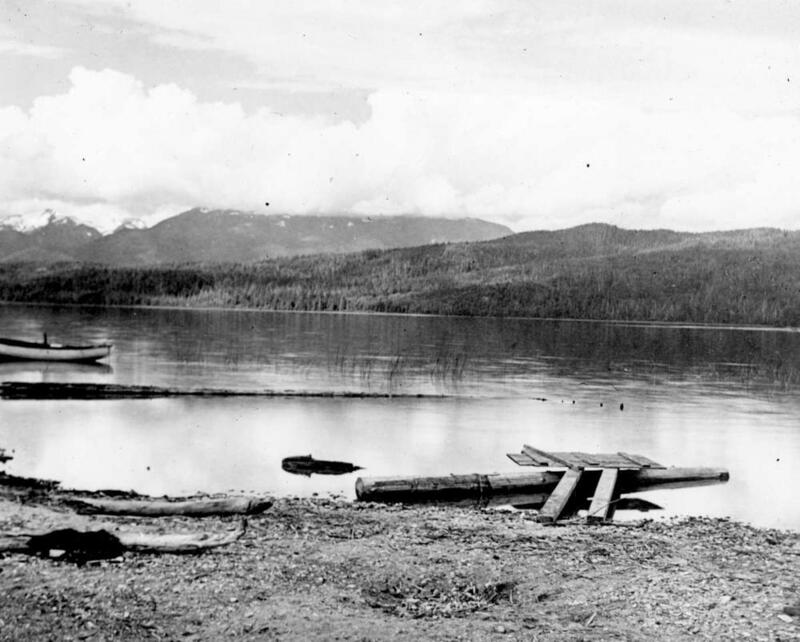 Item I-52655 - "Lakelse Lake and hot-springs, pleasure resort near Terrace - central interior of British Columbia".